This no longer looks like a smooth progression; there's a noticeable reversal between, say, #f00 and #777. 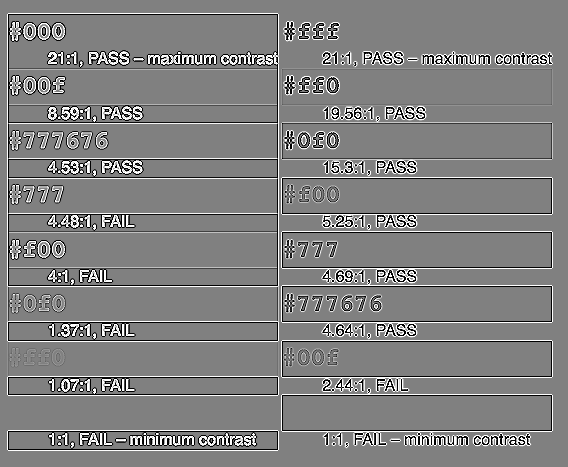 And after applying a threshold to remove insufficient contrast, it seems like one side is favored out of proportion. Is it a byproduct of how browsers antialias text? 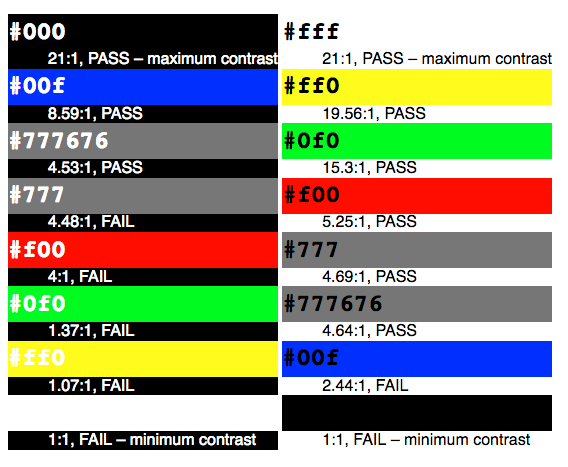 Am I in the wrong color space? I tried inverting the input and averaging its results together with the original's results, but I'm not seeing a difference other than which way the ringing travels. Similarly, switching the kernel matrix's signs doesn't change the progression. These images are from The GIMP's filter operations, but ultimately I aim to create an SVG <filter> to dynamically highlight insufficient color contrast in web pages. I'm sure I'm not articulating with the right terminology, so please ask for more context if I'm unclear. Browse other questions tagged color edge-detection filtering or ask your own question.